The Holland Gas Grill is not an “ordinary” gas grill. Made right here in the USA, the Holland gas grills cook food better and does it more easily than any gas BBQ grill made. Period. Many have tried to copy the unique indirect grilling system but none have succeeded. If you’re looking for a gas grill that’s easy to use and grills the most tender, juicy food you’ll ever taste, you’re looking for a Holland Gas Grill. Great food, no flare-ups and hassle-free! And remember–if you’re lookin’, you’re not cookin! Tired of fighting the fire on an ordinary gas grill? 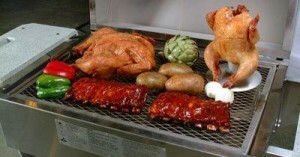 Our exclusive drip pan is between the food and the flame, so food won’t catch on fire. 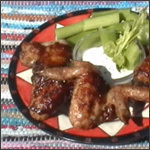 Drippings strike the drip pan and sizzle and smoke, giving the food its distinctive Holland Grill juicy flavor. The Holland Gas Grill is the only grill made which offers a No Flare-Up Guarantee–in writing! Why Buy A Holland Grill? Holland’s signature smoke stacks help pull air into the grill where it is heated and circulated much like a convection oven. They also allow enough heat to escape to maintain a constant temperature in Holland’s hassle-free one-temperature setting. The stainless steel cooking grid will last a lifetime, is easy to clean and its diamond-shaped pattern prevents small food items from falling through. The rust-free aluminum drip pan catches the juices from the food where they sizzle and smoke back up on the food, giving it that distinctive Holland-Grill flavor. There’s no charcoal, lava rock, ceramic tiles, etc. to clean. The drip pan slopes slightly to channel all the excess grease down a 3/4″ drain pipe and away from the flame. A stainless steel deflector plate spreads the flame out so that you have a relatively even heating pattern. The heart of it all–Holland’s cast-iron burner is guaranteed for the life of the grill. No more replacing rusted out burners every year! Now that’s hassle-free. Get Recipes For The Holland! 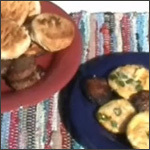 Here is another YouTube video showing the art of grilling breakfast – sausage, eggs and biscuits! 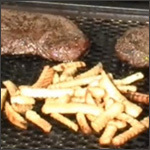 This YouTube video shows how to grill steak and burgers AND fries on theHolland Grill. Yum!